Coming straight out of Manchester, Thursday night (9/25) at Decibel Festival will feature heavyweights from the Modern Love roster, namely Andy Stott, Mikes Whittaker and Miles’ and Andy’s respective side-projects Millie & Andrea and Demdike Stare. Of course, reducing Millie & Andrea and Demdike Stare, the former Stott and Whittaker’s fellowship and the latter Whittaker and Sean Canty’s effort, to a footnote is silly and the collective’s performance at Decibel is slated to be one of the most explosive, driving events of the week. Born out of the ashes of the Peicanneck record shop (which would later become Boomkat), Modern Love was founded in 2002 and has formed one of the key pillars of the city’s dance music avant-garde. Equal parts grave/minimalist and overblown/maximalist, Modern Love has gone through a number of incantations and the most recent has been dominated by Stott and Whittaker. The former’s dub techno epic Luxury Problems transcended its own genre label and is still percolating through the popular consciousness two consciousness while the latter’s work on Demdike Stare has garnered an affinity from noise fans and dance music devotees alike. On Thursday at Decibel, the Modern Love-ians will take the stage at EMP Level 3, the upstairs area of the museum/concert space. All three acts are bringing out their live sets and Stott’s solo set will feature a full a/v component. The showcase will surely feature its share of intrigue from the three acts, but expect a hard-hitting, percussive backbone, masterful dynamics between performers and a singular aesthetic defined by a yearning be somewhere else that defies each respective act’s disparate source material. 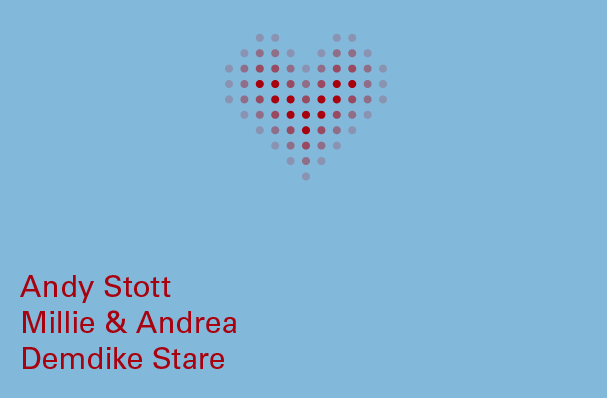 And while Stott’s solo material and the Demdike Stare project have proven to be two of the more captivating sonic projects in recent years, Millie & Andrea’s set has this particular writer impatient with excitement. Ostensibly “less serious” in the musicians’ own words. Millie & Andrea’s performance is sure to feature the percussive acrobatics that have become the sound du jour of club music producers in recent years. The duo’s debut LP, Drop The Vowels, was released earlier this year on Modern Love and is one of the most comprehensive accounts of percussion I’ve heard in a long time, bringing breakbeats, electro, house and techno, played out on numerous classic drum machines, into the same singular melange. After the clanging affect of Millie & Andrea, I have a feeling that Stott’s solo headline performance will sound downright angelic. Buy single tickets for the Modern Love showcase here.